Rumah eyang offer you 8 full-furnished rooms, family owned and managed, a home for travelers with very limited budget around the globe. Now serve with affordable boarding house. From the Airport: use Trans-Jogja Bus (40 minutes ride), stop at Taman Pintar. Walk towards the street's corner, take a left turn at Hotel Limaran, go straight 300m (northward), cross the street at Fortuna Store, walk 30m until you reach our alley. Walk a bit, knock on the first door at the left side. From Tugu Train Station: Take Bus No.2 (about 10 minutes), stop at Pasar Beringharjo, walk 20m, until you reach Ratmakan alley (a Gapura with Ratmakan name is at the entry), go downhill, Rumah Eyang's door is the first door on the left. 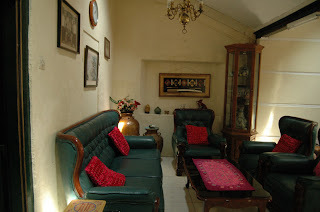 Need more of discounted hotels in Yogyakarta?